Waiting restlessly for the third season of Rick and Morty? 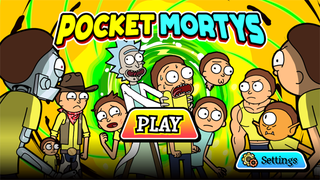 Well, I can’t help you with that at all, but maybe I can help you kill time until the inevitable but painfully far-off announcement because Adult Swim has just released Pocket Mortys for Android and iOS. It’s a surprisingly faithful urm... “homage” to Pocket Monsters AKA Pokémon. Essentially, you play as Rick who’s catching abandoned Mortys and collecting data on his MortyPad. I haven’t done much with the game aside from finishing the tutorial battle against “Mysterious Rick”, his Morty, and a stray cat (an expy of Team Rocket) so I can’t really tell you if the game’s any good, but it’s free. You might as well try it if you like Rick and Morty and Pokémon. I’m not sure if the target demographics of those two IPs overlap, but it sure as hell is more likely than say... Final Fantasy and Louis Vuitton.